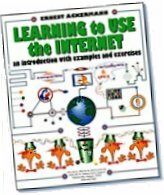 This World Wide Web page is an electronic companion to the book Learning to Use the Internet, by Ernest C. Ackermann . It contains links to all the Internet resources, sites, and services mentioned throughout the book. Using this you can access the items mentioned in the book directly, without typing the long addresses or URLs for each item. Each item is listed under the chapter where it's mentioned, and, if it was used in one of the examples, under the title and number of the example. The book is organized into four major sections. Introduction to the Internet and the three basic Internet services: e-mail, Telnet, and FTP. Chapter 1 Introducing the Internet. Getting involved in discussions on the Internet: interest groups and Usenet news. Ethical, legal, security and social issues related to the Internet. The book contains two appendices. A brief guide to using Unix for users who have access to the Internet through computer systems that use Unix as the operating system. The other focuses on Netscape Navigator, one of the most popular World Wide Web broswers. A glossary of Internet terms is also included. The book is written for people who want to learn to use the Internet. The explanations, examples and exercises have come from my experiences learning how to use the Internet and from teaching others in workshops and classes. The target audience is new or infrequent users of the Internet. It's designed for people who have a connection to the Internet and want to know how to use that connection in a productive and satisfying way to access services, resources, and information, and communicate electronically with others. Why things work the way they do on the Internet is given some attention, but the focus is on learning how to use the Internet in a step-by-step manner. The book can be used by individuals learning on their own or it can be used as a primary or supplemental text book in courses dealing with the Internet. Web pages with links to the ones that accompany Learning to Use the Internet.